Major gifts are the largest gifts an organization receives. Some larger organizations consider gifts over $100,000 to be major, while others consider $2,000 to be a major contribution. Studies have shown that, on average, over 88% of all funds come from just 12% of donors. That 12% constitutes the donations from your major gift contributors. Given their respective impact on your fundraising total, it’s clear to see why having a robust major giving program should be a priority. What is a major gift officer? Major gift officers (MGOs) lead all things major giving for nonprofits and fundraising organizations. From identification to cultivation to solicitation to stewardship, they build relationships with prospects who have the capacity and affinity to donate a major gift. The role is partly tied to organization size. An MGO at a large nonprofit is likely to be part of a team of officers, whereas a smaller organization might have an existing staff member take on the responsibilities. Learn more about major giving with our free white paper! 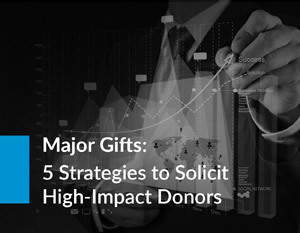 Finding major donors is exactly as it sounds: it’s the process of identifying possible major gift prospects. Since major gifts make up a large part of overall funds raised, it’s vital that organizations invest time in pinpointing potential prospects. A large part of prospect identification involves conducting prospect research into an organization’s donor or supporter base. Major gift officers (or whoever does prospect research for high-level donors within your organization) focus primarily on wealth markers and philanthropic indicators. A combined examination of wealth markers and philanthropic indicators will reveal both a prospect’s financial capacity to make a major contribution and their openness to doing so. Learn more about prospect research and identification! Philanthropic indicators speak to a prospect’s affinity for charitable work and your organization. Logically, a donor who has given in the past, who has been involved recently and frequently, and who has donated large sums over time is highly likely to donate a major gift in the future. These indicators are what people typically think of when they consider prime candidates for major giving. Wealth markers are simply signals of someone’s financial capacity to give – just as philanthropic markers are a good indication of a prospect’s willingness to donate to charity. Donors who have given between $5k and $10k to a nonprofit are 5 times more likely to donate charitably than the average person. An individual that owns $2+ million worth of real estate is 17 times more likely to give philanthropically than the average person. Whether as a foundation trustee, a director, a board member, or as a volunteer, someone who has been directly involved with your organization is miles ahead of anyone else on your list. Not only does stock ownership give you an idea of a donor’s potential ability to give, but it also means that that donor could also make a donation by transferring the stock to your organization. RFM scores speak to the recency, frequency, and monetary value of the gifts that have been made by a prospect. The more recent, the higher the frequency, and the greater the value of past gifts, the more likely that donor is to be an ideal prospect. Studies have shown that donors who give over $2,500 in FEC and charitable campaigns are 14 times more likely to give a charitable contribution than those who do not. Their track records demonstrate a clear openness to giving. Learn more about philanthropic indicators! Learn more about wealth markers! Cultivation is your major gift officer’s time to connect with and learn more about a prospect so their eventual solicitation is more informed. The get-to-know-you visit is one of the most crucial steps in the prospect cultivation phase. Major giving is a very personal process, and in-person meetings build the foundation for a meaningful relationship with your potential major gift donors. Small, exclusive, and personal — that’s the level of event you want to bring your major gift donors to. Show them that they are not just donors — they are also a very important part of your organization and play a key role in serving your mission. Show potential donors what you’re all about, what you’re doing on the ground, and what you’re operating with on a day-to-day basis. This is a proven way to solidify a donor’s interest in giving a substantial gift to your nonprofit. Hosting a dinner or other sort of exclusive meet-and-greet with your executive director is a great way to court and ultimately cultivate potential major gift donors. Let them see that leadership is invested in them. Just because a major donor prospect is presumably going to be donating a large sum of money, it doesn’t mean they wouldn’t appreciate volunteering. A personalized volunteering opportunity lets your major donors in on the action, allowing them to experience your organization’s work firsthand. Informational luncheons offer a casual way to further educate prospects about major giving without being too formal. Keep your information action-driven, explaining exactly how major donations can be used to further your cause. It’s a low-stakes environment to learn about your cause and get inspired! Check out more major donor cultivation tips! Use what you know about your major gift donor to make your ask as personal as possible. 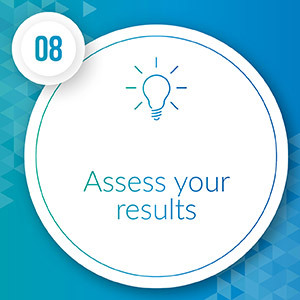 Go beyond the facts and figures you’ve gleaned from prospect research and tailor your ask to the person: who he or she is and what makes them tick. Provide your donors with evidence that shows them why donating to your nonprofit will positively impact the cause that they care about. Have physical documents at your disposal that summarize your case for major donations. Using the information that you’ve gathered from prospect screening, determine a reasonable amount to request. The amount you ask for should reflect your donor’s abilities and past donations. Aim high, but be courteous. Plan out your half of the conversation, anticipating what your donor may say in response. Highlight the major points that you need to hit to create an effective pitch so that nothing important is forgotten in the course of the conversation. Expect that your donor will want to negotiate. Begin your ask by making your highest request first. If a donor says yes right away, you’ve probably left money on the table. Whittle down your original request until both you and your donor feel comfortable. Have a plan in place for following up with your asks. Depending on your donor’s response, you may need to confirm a donation, send more information, or try a new approach. Be sure you have reliable contact information and notes from the meeting. What is Major Donor Stewardship? Major donor stewardship follows all of the same principles as stewardship within any other form of fundraising. It centers around acknowledging, recognizing, and thanking your donors. Where it differs from the rest is in the execution. Major gift donor acknowledgments should be commensurate with the level of the contribution. Their gifts are game-changers, and your stewardship should match that. Why is Stewardship So Important? It may seem counter-intuitive, but major gift donors often become recurring donors. One might think that if a donor has already contributed a significant sum, they would no longer be interested in giving any further. But this actually hasn’t shown to be the case. And that’s part of why stewardship is so vital. It’s proper stewardship that ensures the retention of a major gift donor in the long run. Build on all the effort you’ve already put in! What are the Stewardship Best Practices? More than just streamlining the process of donating and sending out personalized acknowledgements, the best practices for crafting a successful stewardship strategy are about matching the level of commitment and enthusiasm that a major gift signifies. Practically, this means curating experiences and opportunities to thank and celebrate your major gift donors. Again, a lot of the same principles apply, just on a grander scale. 1. Get leadership on board. Major gift efforts require everyone on your team to be involved in some way, shape, or form. So you’ll need all the support from leadership that you can get. As we mentioned earlier, a great technique for courting major donors is to introduce them to your organization’s executive director. Plus, your leadership team likely has valuable major donor connections, since people of philanthropic interest tend to flock together! 2. Recruit your fundraising team. In addition to having your leadership on board, you’ll also want to have board members, fundraisers, prospect researchers, and even some marketers on your team. The success of your major gifts effort relies on having all hands on deck at any given time. 3. Determine what qualifies as a major gift at your organization. What qualifies as a major gift will fluctuate not only from organization to organization, but also within your organization. As you grow, your standards will naturally change. It’s important to update your standards every so often, as this standard will dictate the level of strategy given to cultivating and soliciting certain prospects over others. You might be surprised by the number of major gift prospects that you already have within your existing donor base. Prospect research is the best way to find out who among them is likely to give a major gift. A proven willingness to give (a history of giving to nonprofits). A demonstrated capacity to give (tangible wealth markers). If those two key factors are in alignment, there’s a high likelihood that that person could be a major gift donor. When a major gift donor gives to your organization, they expect to see tangible results from that contribution. This means that they want to see how their gifts are effecting real change. They also might expect some kind of program perks. Incentives for donating never hurt! For instance, if a major gift donor gives a significant contribution to your capital campaign, they may want to have the opportunity to name the building they’re helping to fund. In either case, your donors want to know that their major gifts are being used effectively. 6. Create a solicitation strategy. Have your prospect researchers put together profiles on your candidates with recommended asks. Then divide the profiles among your fundraising team. Each team member should work in conjunction with your board and marketers to create the ultimate presentation for each of the prospects. The next step is to begin the solicitation process. It’s time to make the ask! 7. Implement a stewardship program. Major gift donors are investing a lot in your organization. It only makes sense to reciprocate. Because there likely aren’t an overwhelming number of major gift donors within your donor pool, you can absolutely take the time to cultivate meaningful relationships with each and every one of them. Taking the time to really get to know them. Finding creative ways to recognize them. Sending them thank yous occasionally throughout the year, even when they haven’t donated recently. Corresponding about topics outside of asks and acknowledgements. Stewardship is one of the most important steps in the entire process. Make sure you have a firm plan in place for how you maintain relationships after the gift has been made. It’s always a good idea to evaluate key performance metrics when implementing any sort of fundraising strategy. It’s especially important to do so when you’re going through the major gift acquisition process. Average giving capacity (of top donors). With these metrics in mind, you can assess your existing campaign and plan to improve your strategy in the future. Learn more about starting a major gift program! The Strategy: Creating a customized proposal is a vital step. Call upon the relationship you’ve built with your major donor to craft the most effective proposal possible. How to implement: Call them by their preferred name in letters, emails, and in-person conversations. Use their desired titles and pay attention to the level of formality that they prefer. The Strategy: Present your donors options so they can make an active choice in how their money is being used. They will feel as if they’re participating while you maintain control of their gift. How to implement: Summarize the programs in need of assistance. Try to guide your donor toward high levels of need, but do not tell them how to give their money. The Strategy: Your donor is already acquainted with your organization and its cause. Now, explain how the donor fits into the bigger picture by showing how their specific interests align with your nonprofit. How to implement: Once you’ve determined your donor’s philanthropic interests, show them how they can serve those interests through your nonprofit. Prepare your asking strategy based upon the donor’s profile. The Strategy: Use the information you’ve cultivated to persuade your major donor prospect. You should know from your research what their giving capacity is so that you can make an informed and accurate request. How to implement: Using the information you’ve gathered about your donor, make a direct ask that includes the amount you want, the program that needs the donation, and why this particular program requires this gift. Be clear about what you need. The Strategy: Thanking your donors and acknowledging their past contributions shows your gratitude and encourages them to donate more. How to implement: If you’re speaking with someone who has previously given to your organization, mention how helpful their gift was. If they are a new donor, you can recognize them for their philanthropic interests and generous spirit. The Strategy: Illustrate the impact of the gift to your donor. By explaining how their gift will be used to further your nonprofit’s cause, you can give them a clear idea of their value and necessity to your organization. How to implement: Discuss how the donation could be used hypothetically, and support your statement with concrete data and examples or success stories to show how gifts are used for good. It’s always a good idea to host an event to get to know potential major donors better. Typically, these events are galas or live auctions. Pulling in prospects. Events like this, by nature, get a lot of people capable of making a large donation in one room together. Making the connection. Getting to know these donors a little better gives your fundraisers a clearer picture of who would be the top prospects to pursue. Your board members often have the kind of connections you need to reach out to certain prospects. Assess prospects. Don’t overlook the people who are already within your organization! Evaluate the connections already available to your board. Initiate the process. Ask your board members to reach out to key people in their networks. Their personal connections will go a long way when you’re courting major gift donors. Retain the connection. Consider including the board member who introduced you to the major donor in all communications. Before a donor commits to a major gift, they’ll likely want to know what their return on investment would be. Emphasize their specific areas of interest. Pitch the programs with great results that also speak to your donor’s philanthropic interests. Be clear. Communicate how much you would need for your project and what that money would accomplish realistically. Be transparent with your numbers. Fit into the bigger picture. Showing your donor how their donation helps your overall goal can make them feel like they’re part of a bigger cause. Major donor societies are essentially members-only clubs for your most generous contributors. Think of your major gift society as a chance to build a close-knit community of major donors. Exclusivity. The exclusivity makes donors feel as though they’re a part of something special — because they are! Incentive. Setting a minimum donation amount for acceptance to the society encourages donors to give more than they otherwise might have. Stewardship. Having a major gift society allows your organization to put an excellent stewardship process in place across the board. Nothing gets donors (of all sizes) as excited or invested in giving to your organization as getting hands-on with your work. Initiate volunteering. Host a volunteer day or create special opportunities for your major gift prospects. Encourage active participation. If your major donor is interested in your volunteer work, they’ll be more engaged. Let them participate directly with the cause. Give tangible results. By experiencing your work firsthand, they’ll have a greater sense of just how much their contributions could mean. Because they’re giving a substantial sum to your organization, major donors understandably want to know how their money will be used. Day-to-day details. Show them the nitty-gritty, day-to-day details of the work their contribution is doing so that they can visualize their financial support in practice. Overall progress. Make it a priority to zoom out and show them how their contribution extends beyond a singular project. Their impact. Show them that their gift has made a large and lasting impact on your mission and the cause you serve. Give specific results or examples. Read more top major donor strategies! Annual fund donors are some of your nonprofit’s most dedicated supporters. Because of this, your team should look towards annual givers when identifying major giving prospects. Once you identify a prospect with the right financial capacity and a proven record of annual fundraising support, make your solicitation! Learn all about annual giving! During a capital campaign’s quiet phase (before the fundraising effort is publicly promoted), the whole team works diligently to secure major gifts. Approximately 60% of the average campaign’s total is raised during that major-gift-centric phase. As such, major gift know-how is absolutely crucial for rolling out a successful capital campaign. 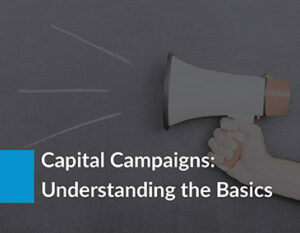 Learn more about capital campaigns! Planned gift and major gift prospects share some DNA. Both often have a history with the organization and a proven connection to philanthropic work. They also often have similar giving capacities from a financial perspective. Because of those shared predictors, it’s important to compare respective donor pools for the giving types. Learn more about planned giving! In essence, a major gift officer leads all things major gifts-related. Coordinating the major gift program. Determining the direction of your major giving program. Selecting major gift prospects for cultivation. Building relationships with major donor prospects. Soliciting donations from major gift donors. Designing a major gift donor stewardship program. Education level is important in determining the caliber of the candidate, but at the end of the day, finding someone with the right experience should be your number one priority. For the most part, the only educational experience that is truly necessary is a bachelor’s degree. There are, of course, graduate degrees and certificates in fundraising that a person can obtain; but in practice, the most useful knowledge comes not from academic curricula but from being hands-on with the major gifts process for a number of years. Having the right skills is essential to being a good major gifts officer. An extensive familiarity with fundraising. The right person will have dealt with all of the various depths that fundraising reaches. Excellent communication skills. Long story short, they need to be able to communicate not only with your donors, but also with the other team members in your organization. A willingness to power through challenges. Major gift fundraising is tough; make sure you pick someone who’s up to the challenge. Read more about the role of a major gifts officer! The higher you aim with major giving, the more extensive your prospect research efforts will need to be, and the more you’ll need support to maximize your efforts. Luckily, with the help of a screening tool, you can drastically cut down on the time your team spends researching, freeing them up to focus on cultivation, solicitation, and stewardship. Look for a software that offers you a mobile-responsive view of your prospects so that you can stay updated on-the-go! Between all the meetings and interactions leading up to the ask and the final solicitation presentation itself, you’re going to require the support of highly informative documentation. Once you’ve created templates for the various required materials, you’ll be able to personalize each template for the needs of every specific major gift prospect. Customizing your marketing materials with information from your prospect profile templates can improve your relationship with your prospects. Helpful in mapping out the gift amount you’re aiming for, major gift calculators offer a great way to visually represent how your team should approach your fundraising goal. Presented as a chart, the gift calculator will tell you how many gifts you need to acquire at various giving levels to reach your goal. They give fundraisers exact targets to aim for. A gift range chart guide can steer your development team in the right direction when planning a campaign. It is imperative that your team has an effective and efficient way of tracking and managing the various types of donor data that you encounter throughout the different stages of major giving. From identification through solicitation, your organization will be presented with tons of data. Those who know how to manage that data are the ones whose major gift programs truly take off. The first step of managing your donor data is having a comprehensive major giving CRM, so make sure you choose the right software for your organization. Check out this major giving CRM for some good ideas! Test out a demo of our prospect screening software! What is this? Return on investment is a metric that tracks the fundraising profit relative to its costs. Specifically, it calculates how much money you raised per every dollar spent. Apply ROI to major gifts to see if your efforts are paying off. How do we track it? Divide the net revenue of your major gifts efforts by the total cost. If the number is greater than 1, you’ve made a profit. What is this? The average major gift size is the average amount of donated money that qualifies as a major gift. To calculate, divide your revenue from a certain time period and/or event by the total number of major gifts in that same frame. How do we track it? You can track average gift size for specific events or over a designated time period, allowing you to measure whether or not your major gifts are growing overall. What is this? Your major donor retention rate is the percentage of recurring major donors over a certain period of time. Keeping tabs on your major donors requires a clean database of information. Be sure to update your donor information frequently so that you can identify donors who are no longer active. How do we track it? Divide the number of recurring major donors by the total number of major donors; then, multiply by 100. What is this? Giving capacity is an informed estimate of how much your donor can give. It can help you to make more targeted, accurate requests for donations. Compare your average giving capacity to your average major gift size to ensure there isn’t a sizable discrepancy. How do we track it? Analyze the donor’s connection to your cause, their philanthropic propensity, and their wealth markers. What is this? This metric shows the number of major gifts that you’ve received over a certain period of time. How do we track it? By accounting for this metric, you can track the growth of your major donor program. What is this? Asks made are the amount of times your major gift officers have asked for a donation. How do we track it? Keep a running tally of your asks. Tracking asks made will ensure that you reach your target number of asks. Study up on even more metrics here! What can the data tell you? Data is key in the major gifts world. The more you know about your prospects, the better equipped you’ll be to make an ask. And the more you know about your existing donors, the more you can keep them engaged. If you know where to look, the data tells you who is most likely to make a donation and how they’d like you to handle cultivation and stewardship. Sophisticated handling of donor data will give your program a big leg up. How do you determine giving capacity? As a part of your data analysis for major giving, you’ll need to zero in on the information that determines donor giving capacity. At the end of the day, a donor’s wealth plays a major role in major giving. You can estimate giving capacity scores by looking at a donor’s wealth markers like real estate. Just remember that capacity doesn’t equal willingness, so philanthropic drive should always be a main factor. Learn more about determining donor giving capacity! One of the most important tools nonprofits have at their disposal when soliciting major donors is prospect research. Brush up on everything there is to know with our newly-updated prospect research guide! 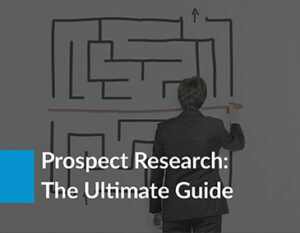 Discover everything you need to know about prospect research! Capital campaigns rely heavily on major donors in order to help them meet their fundraising goals. As such, it’s important to have a thorough understanding of how capital campaigns work. Check out our handy guide to learn more! Read more about planning and executing capital campaigns! Still feeling a little lost when it comes to all things major gifts? Double the Donation has got you covered! 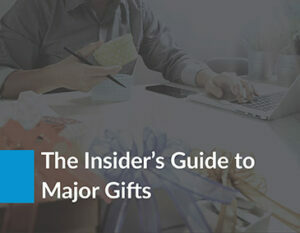 Take a look at their comprehensive insider’s guide to major gifts to get even more useful information and support! Learn more about the ins and outs of major gifts! Are you working on your major gifts strategies and need a boost to increase your fundraising? ClearView CRM, a top major giving CRM, has some tips for you! Take a look at their comprehensive guide for ideas to improve your solicitation strategy. Brush up your major giving solicitation strategies!